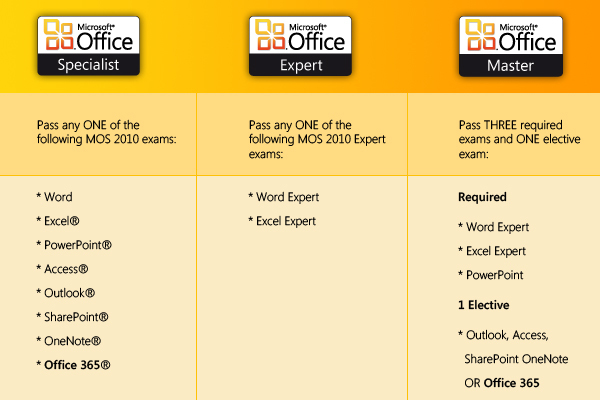 Microsoft and Certiport are pleased to announce the coming addition of Microsoft Office 365 to the suite of Microsoft Office Specialist (MOS) 2010 certifications—the world's most recognized, standards-based credential chosen by individuals seeking to validate their aptitude and proficiencies on Microsoft Office. On August 31, 2012, MOS Certification candidates will have an eighth option and opportunity to build competences and distinguish themselves with skills that are in demand among today's employers. Web-based computing ("the cloud") is undeniably the future for Microsoft Office applications and technology. Now students, job seekers and office professionals have a means for demonstrating aptitude and proficiencies with Microsoft Office in the cloud! Office 365 MOS Certification will heighten relevance among those who earn it. As with other MOS designations, it will build college and career readiness for students, provide individual distinction among job hunters, and heighten performance and job satisfaction of office workers. The new Office 365 certification exam joins a prominent collection of MOS 2010 certifications - Microsoft Word, Excel®, PowerPoint®, Outlook®, Access®, SharePoint® and OneNote®.